The Baylor University full-time MBA program at the Hankamer School of Business is a 53 credit hour full-time program that can be completed in as few as 16 or as many as 21 months. The time it will take to complete the degree depends on a student’s undergraduate background. Students who do not have an undergraduate degree in business are required to complete two Business Foundations classes. These Business Foundations classes will provide students with the necessary knowledge to successfully complete the MBA core curriculum. Students who need to complete the foundation courses can begin in the summer or in the fall. 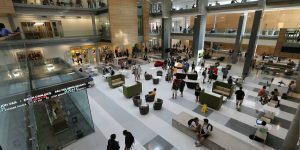 Students in the Baylor University full-time MBA program complete 35 credit hours of core classes, 15 credit hours of electives and a three credit hour internship, for a total of 53 credits. Students have the option to concentrate their MBA degree in a specific field by completing nine credit hours of elective courses in finance, information systems, international business or marketing. Students can also customize their degree by completing a specialization in healthcare or entrepreneurship. The healthcare specialization is part of the Robbins Institute for Health Policy and Leadership. Students complete the MBA core courses in addition to the Health Care specialization courses and elective courses. Hankamer MBA Students are also required to complete a seven-month paid residency (June to December) in a leading healthcare institution. Students in the healthcare specialization who need to complete the Business Foundations courses will graduate in 24 months instead of the usual 21 months, because of the residency requirement. The entrepreneurship specialization offers students two sequences along with the specialization. Students can complete their entrepreneurship specialization in New Venture Creation or in Corporate Entrepreneurship. The New Venture Creation sequence is designed to prepare students to start, develop, finance and manage new ventures with high growth potential while the Corporate Entrepreneurship focuses on expanding existing ventures. Students in the Entrepreneurship specialization also compete in the New Venture Business Plan Competition and make weekly visits to G-51 Capital Management, LLC, in Austin to get hands-on experience with investing. The most recent Baylor full-time MBA class featured 47 students. These entrants had an average GMAT of 607, a GRE of 310, and a GPA of 3.43. About 43 percent of the class are female students, with 17 percent international students, and 28 percent U.S. minority students. The most recent Baylor full-time MBA graduating class had a 74 percent job placement rate at the time of graduation and 95 percent placement rate 90 days after graduation. The average starting salary was $71,706 and the average signing bonus was $5,188. The estimated cost for tuition and fees for the Baylor University full-time MBA program is $23,882 per semester. Students are required to take two career development courses that are an additional $1,000 per course. Some courses also require students to pay lab fees of $50 per course. The estimated cost of books and materials per year is $1,300. Many Baylor University students complete the MBA program as part of the Army’s Advanced Civil Schooling (ACS) program. In addition to this program, Baylor is also one of the military-friendly schools that are included in the GMAC MBA Planner for Military Officers. Baylor also aids veterans in tuition through the Baylor VA Education Benefits. In addition to military benefits, student veterans are also eligible for academic scholarships to help cover any additional costs of the program. The criteria for being awarded a scholarship are based on work experience, GMAT/GRE scores and academic record. The school also offers tuition scholarships ranging from 25 to 100 percent of the tuition costs. To be considered for financial awards, applicants must simply indicate on the admission form that they would like to be evaluated for a scholarship. Several Graduate Assistant (GA) positions for MBA students are also available to help cover the cost of tuition. GAs work an average of 10 hours per week for a faculty or staff member in the business school. Many other forms of financial aid are also available to Baylor full-time MBA students. Students can apply for federal financial aid, federal loans, private loans, state and federal grants and various work-study programs. Prospective students can contact the Student Financial Aid Office at Financial_Aid@baylor.edu or call 1-800-BAYLOR-U. Either the GMAT or GRE is required for application to the full-time MBA program. There is no minimum GMAT or GRE score requirement. There is no professional work experience requirement for the MBA program, but it is strongly recommended for applicants to have prior work experience. Students do not have to have an undergraduate background in business for the MBA program. To complete the online application for the full-time MBA program, applicants must first create an online GoBAYLOR Grad account. After completing the account and applicant profile, prospective students can complete the application process. Applicants must complete two essays as part of the admissions process. These essays are 200 to 500 words that will give applicants the opportunity to share their qualifications, experiences and reasons for applying to the MBA program. Applicants must also provide a current resume describing those activities, honors, or awards that they believe serve as indicators of potential success in the full-time MBA program, contact information for two professional references, transcripts from all degree granting institutions (Baylor alumni do not have to submit transcripts), GMAT or GRE scores and TOEFL, IELTS or PTE Academic scores (for international applicants). Applicants are also required to pay a $50 non-refundable application fee (veterans and current military are not required to pay the fee). Applicants are also required to schedule an admissions interview. Applicants can complete a registration form for an admissions interview online. Applications received after the published deadlines are reviewed on a case-by-case basis. Decisions for admission are usually made within two weeks of receiving all required materials. The Admissions Office must receive all required application documents before a decision will be made. Which Dallas MBA Programs Offer the Best Starting Salary?